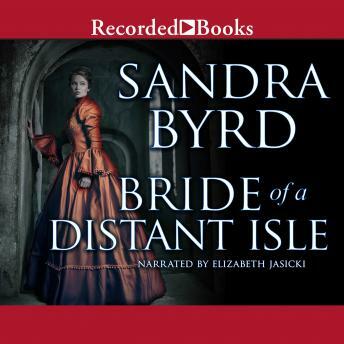 An unforgettable romance set in Victorian England, Bride of A Distant Isle is the engrossing story of Annabel Ashton, who fights to save her family home and her mother's honor while trying to figure out if the man she loves wants her-or just wants to use her to achieve his own ambitions. Miss Annabel Ashton is a teacher at the Rogers School for Young Ladies in Winchester when she takes a brief visit to her family home, Highcliffe Hall at Milford-on-Sea. She believes her stay will be short but soon learns that she will not be returning to the safety of the school. Instead, she remains at Highcliffe, at the mercy of her cousin, Edward Everedge. Annabel protests, but as the illegitimate daughter of a woman who died in an insane asylum, she has little say. Edward is running out of money and puts the house up for sale to avoid financial ruin. He insists that Annabel marry, promising her to a sinister, frightening man. But as the house gets packed for sale, it begins to reveal disquieting secrets. Jewelry, artifacts, and portraits mysteriously appear, suggesting that Annabel may be the true heir of Highcliffe. She has only a few months to prove her legitimacy, perhaps with assistance from the handsome but troubled Maltese Captain Dell'Acqua. But does he have Annabel's best interests at heart? And then, a final, most ominous barrier to both her inheritance and her existence appears: a situation neither she nor anyone else could have expected. Will Annabel regain her life and property-and trust her heart-before it's too late?